Lakes Environmental Association When does your lake freeze? When does your lake freeze? When a lake gets covered with ice, the system changes. Oxygen is no longer readily infused into the water and wind mixing is eliminated. Less light penetrates into the lake and plant productivity is greatly reduced. 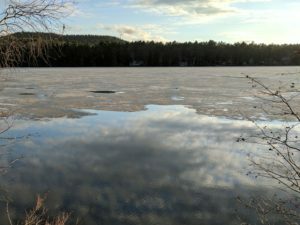 For these reasons, it is important to track when ice forms on a waterbody and when it leaves. Can you help us acquire this important information? Ice phenology is the study of freezing and thawing cycles of lake and river ice. LEA is looking to expand our database of freeze and thaw dates for lakes in our service area. Please send us your “ice-in” date. The freeze date (ice-on or ice-in) is defined as the first date on which the water body was observed to be completely ice covered, and the breakup date (ice-off or ice-out) is the date of the last breakup observed before the spring open water phase. Ice-in occurs when the lake is completely or nearly completely covered with ice. Historical observations were made for different reasons such as religious, cultural, practical (the need for transportation over ice or open water), or out of curiosity. Today, scientists are recognizing the importance of knowing how long lakes are under ice cover. Please send your observations to Alyson at alyson@leamaine.org. Include your name, the lake name, town, and date of ice-in. Thank you!